I've been with Zazzle for quite some time, and it was only recently that I discovered that they finally have a pattern for all-over-print T-Shirts. Since I already had a large collection of artwork stored on there, I began to put some of it on those shirts. Having them on models, which is also just a recent development, makes it so much nicer. There are many more items in my store, but I am most excited about the over-all-prints, because until not long ago, Zazzle did not have them. Die sind richtig cool geworden!! wow, coole t-shirts, gibt's die auch für Männer? I haven't used zazzle much, but I love the all over print shirt you can do in many such places. They are a great way to see a piece you've already made in a new light and with a bit of tweeking you can make it new and even cooler on clothes. Good job @thermoplastic We artists must put our art where we can and we have many more options today, eh? true - I just discovered the all-over the other day since I was not paying much attention to the account. I had been on another service that specializes in all-over printing, but all of a sudden they eliminated the free accounts and wanted $ 20.- per month (plus a $ 75.- sign-up fee) for a pro account (which was optional before). I lost all the designs I made, since I am not paying! So I checked back on Zazzle again to see if I can use the designs on there. I am hoping that in time they will have more than just the t-shirts, leggings and some bags. but you might want to try designing Shoes also - they were off line for a while, but are back again. Yes the all over for shoes and dresses are nice, I have some laid out for my own site that prints on demand, but I haven't launched it yet. I mean I use other aps to get the print on demand, but then it can be on my own site, but it's so much work. 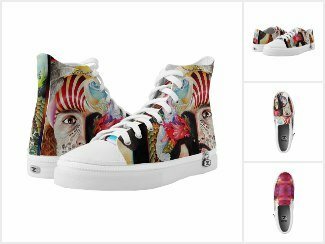 These shoes look so cool with your artwork!